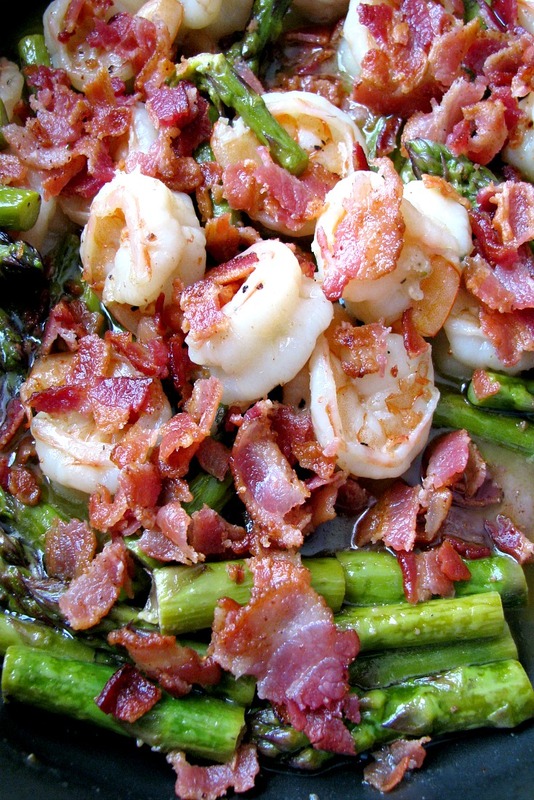 This Shrimp Asparagus Bacon Skillet recipe is made with large fresh shrimp and asparagus sauteed in butter, olive oil, and lemon juice, then topped with crispy bacon. It’s easy to make, flavorful, and can easily include any additions you might like. Skillet shrimp recipes are something we all love in this house, this is the second one I’ve shared with you. They are just about the easiest shrimp recipes because the shrimp only takes a few minutes to cook. Serve the skillet meal over rice or pasta for a delicious, easy dinner that can be ready in less than 30 minutes. 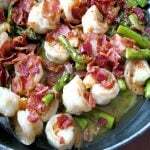 The first time I made this Shrimp Asparagus Bacon Skillet recipe I used thawed cooked shrimp, and you could absolutely do that to make it easier on yourself, but you have to watch that the shrimp doesn’t overcook. In this recipe, I used uncooked shrimp that I peeled and removed the tails. The bacon can be cooked and crumbled ahead of time and kept covered in the refrigerator. The shrimp can be peeled ahead of time as well, and will keep thawed in the refrigerator for a day. 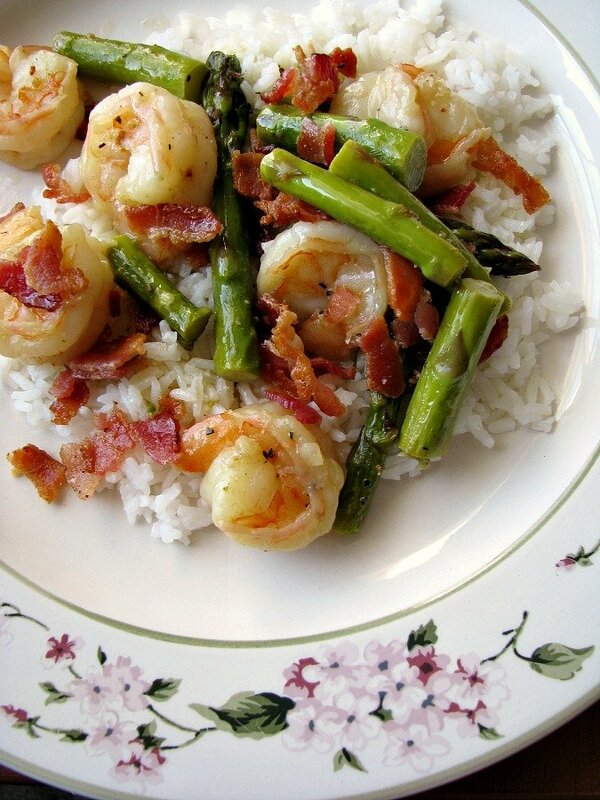 You might want to add a clove or two of minced garlic to the pan when you add the shrimp, if you like. I feel like I add garlic to EVERYTHING and chose not to with this recipe, but I’ll admit I felt it was missing. You could also use chopped onions, or scallions, or replace the asparagus with broccoli. 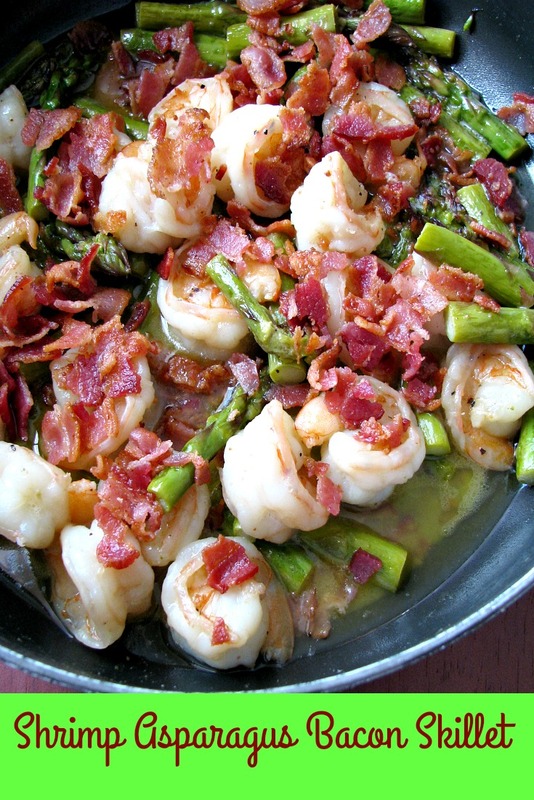 This Shrimp Asparagus Bacon Skillet recipe is made with large fresh shrimp and asparagus sauteed in butter, olive oil, and lemon juice, then topped with crispy bacon. It's easy to make, flavorful, and can easily include any additions you might like. Melt the butter in a large skillet over medium low heat. Add the olive oil and lemon juice and stir. Add the chopped asparagus and cover. Cook for about 10 minutes, stirring occasionally, until the asparagus is slightly soft. Add the shrimp and garlic, if using. Continue to cook, stirring often, until the shrimp is no longer translucent and is white all over. Stir in the crumbled bacon and remove from the heat. Serve with cooked pasta or rice, or by itself along with some of the butter sauce.